Wanted some extra lights for sports touring in the mountains. 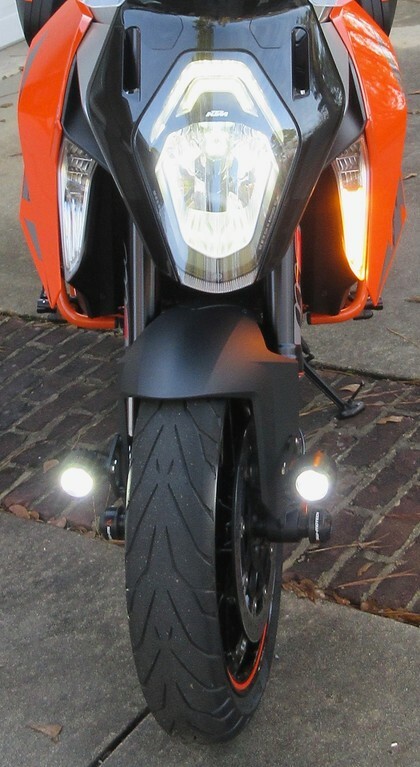 Added the Clearwater Darla’s LED's on my 2017 KTM SDGT ( https://www.clearwaterlights.com/produc ... super-duke ). Utilized their D15/G15 triangular mount. 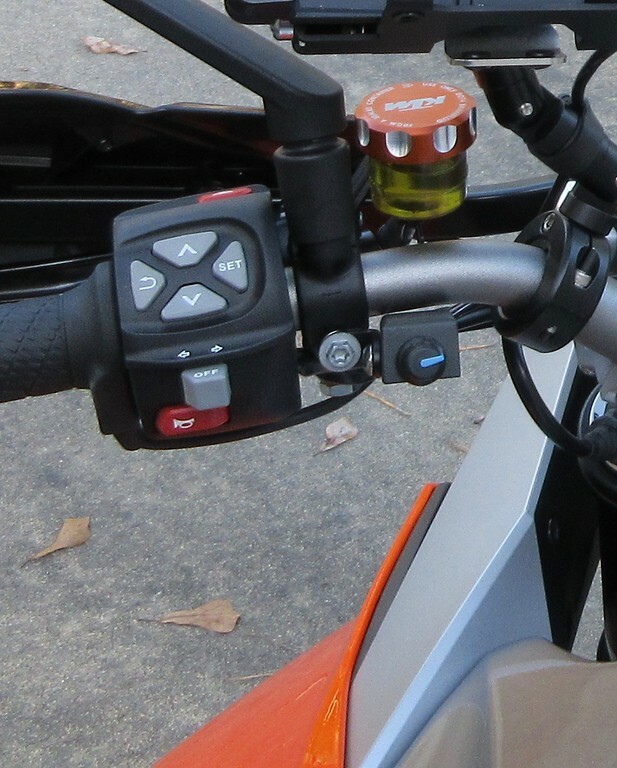 Rheostat was placed on the left side of the handle bar. Also, went with the Cyclops H4 LED bulb conversion for the headlight ( https://www.cyclopsadventuresports.com/ ... p_148.html ). Nice. Does the Cyclops seem to bleed light to light up far and wide , even on low beam ? .. mine does. I also had to adjust the headlight up as high as possible for high beam, which is still too low really. It is brighter, but was a bit disappointed considering it's meant to be made for the GT specifically. Agree, the Cyclops by itself is not optimun lighting. They really need a better H4 LED. This is why I added the Clearwater Darla LED's. I also immediatly noticed when I turn off the bike the Cyclops LED discharges. I bit annoying?? So I guess the Clearwaters are wired direct to battery or an Accessory outlet, so as not to upset CANBUS ? Gary, first of all, I'm glad to announce that I have a bike in transit from the KTM warehouse. Should be here in a few days. Looking at your installation, I'd like to see them higher, and they look like they are susceptible to a lot of bouncing up and down with the suspension and vibration. Did you give consideration to mounting them to the fairing support that appears to start next to the top of the gas tank and runs forward to support the front fairing. I'm referring to the silver parts running forward below the handlebars in your picture of the switch. From the front of the bike it appears to have an air intake. Because I don't have one to look at I'm not sure whether that would offer a mounting option or not. I utilze the Drala's like a runing lights to be seen. They really are of assistance when driving at night in the mountains on Twisty roads. 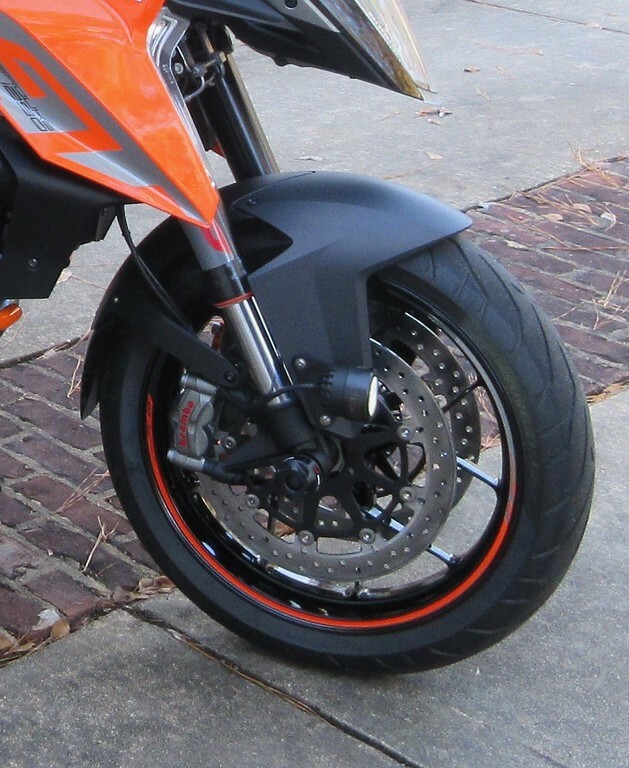 Not certain why you decided not to mount a pair of Erica's on your SW-Motech Crash Bars. Do you think the crash bars aren't sturdy enough for the lights or? Gary, I like the place where U have them. I for one have had lights in the same location on most of my bikes in the last few years to be SEEN by others. Research shows that a spread of lights is much more notable than a single point of light. That's my reasoning.